At Diva Pets, our grooming sessions are designed to keep your pet looking and feeling their best. We also aim to make the session an enjoyable experience for your pets by allowing them the time they need to become comfortable with the groomer and the experiences they will encounter with us. Grooming at Diva Pets always begins with a thorough brushing. This removes mats and tangles, dislodges dirt and excess loose hair, helps deter external parasites and promotes healthy blood flow to the skin. Brushing also feels really good to most pets and allows them to get comfortable with their surroundings and trust their groomer. Next the groomer will move on to trimming paw hair and clipping nails. Trimming paw hair allows your pet to move around more comfortably by keeping their paw pads fully exposed so they have better grip on slippery surfaces (like tiles). It also allows groomers and owners to easily monitor the health of the dogs paws and quickly detect any signs of abrasion, infection or parasites. As dogs nails grow continually, much like our own, they need to be cut every week or two to ensure they don’t press on the floor, split on rough surfaces or even grow round back into the toes, all of which can cause discomfort and become painful if not dealt with. The ears are then cleaned and excess hair in the ear canal is gently removed. Maintaining your pets ears is very important as a build up of wax or hair in the ear can lead to infections and ear mites. Now it’s time for a bath. At Diva Pets we have a wide range of only the best shampoos and conditioners available today to get the most from your dogs coat as well as deal with many skin problems and external parasites. Our most popular shampoo is Chris Christensen’s ‘Day to Day’, a mild shampoo designed to maintain any coat type or colour. For dry coats we would also recommend a series o conditioning spa treatments to bring your dog's coat to the best condition possible. Diva Pets groomers use specially designed ‘turbo dryers’ to quickly dry your pets coat, right to the skin, without removing the natural moisture that protects the coat. The high air speed of our dryers also prevents tangles from forming in the coat during drying. Once the coat is dry, your dog is treated to a second brushing to “fluff” the coat and prepare it for any required cutting or styling. Finally the groomer will trim your dogs coat or set a new style. There are many different styles available for all breeds, some of which focus more on easy maintenance for rough and tumble dogs, whereas others focus more on beauty for the really pampered pooches. Before your grooming session, your groomer will discuss your and your pet’s needs to identify the perfect style to suit your little Diva. Jo Makin graduated from The University of Manchester with her Degree in Management and Leisure BA(HONS) before migrating to Malaysia with her husband in 2006. Unsatisfied with her career, she decided to enter into a field where her life-long passion for animals could be fulfilled. Pet Grooming was the ideal choice as it not only enabled her to work with animals but also accommodated her love for creativity. 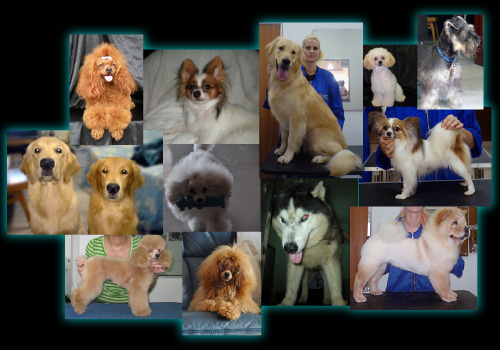 In conjunction to graduating from The House Of Groomers Academy in 2007 as a Professional Canine Cosmetologist, Jo has been persistently improving her skills and knowledge in Show Grooming, Creative Grooming, Canine Health, Psychology and Training. As she ventures deeper into the world of grooming, it only serves to strengthen her love and admiration for Dogs. Today she is the proud mother of 7 beautiful dogs. The wellbeing of animals is one of Jo's major concerns. She is actively working towards the creation of a local animal foster system and future shelter development. She is also an active advocate against animal abuse, neglect, and unsanctioned breeding. "Education is the key to eliminating the cruelty towards animals today." she repeats as a testament to her commitment for a better care standard for all animals.